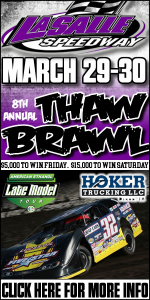 La Salle, IL (Monday, April 1, 2019) – The American Ethanol Late Model Tour (AELMT) and the American Ethanol Modified Tour Presented by Allstar Performance (AEmods) invaded LaSalle Speedway and their 8th Annual Thaw Brawl Presented by Hoker Trucking. The weekend weather proved to be difficult, but fans were treated to an action packed 75 lap main event for the AELMT, and a door-to-door 30-lap feature for the AEmods. The night began with American Ethanol Qualifying for the AELMT, where three groups took to the Speedway in hopes of becoming the Motul Motor Oil and Lubricants Fast Qualifier. Group one was lead by Bobby Pierce, who turned in a 12.834 second lap time, group two lead by Tyler Erb at a 12.936, and Rusty Schlenk topped group three with a 12.932. Pierce, with the over all fast time was awarded the Motul Motor Oil and Lubricants Fast Qualifier award. The AEmods qualifying was next, they also were battling for the Motul Motor Oil and Lubricants Fast Qualifier Award. Frank Marshall topped the overall speed charts turning a 14.096 in group two, while Nick Allen topped the charts in group one with a 14.487. Heat races were next, starting with the AELMT Allstar Performance Heat Race Number One. Brian Shirley held off a charge from Brandon Sheppard and Pierce en route to the win. Logan Arntz, and Jeremiah Hurst finished out the top five who transferred directly into the main event. In American Ethanol Heat Race Number Two, Kyle Bronson bested Dennis Erb, Jr and Chris Simpson. Tyler Erb and Spencer Diercks took the final two transfer spots. The final heat race of the afternoon for the AELMT was the CHS Heat Race Number Three. There, Jason Feger held of a dueling Schlenk and Scott Schmitt, with Brandon Thirlby and Shannon Babb rounding out the transfer spots. In AEmods action, DUPONT Heat Race Number One saw Will Krup power to the win over John McClure and Paul Niznik. All ten drivers transferred into the main event. In Lane Automotive Heat Race Number Two, Allen Weisser held off Frank Marshall and Beau DeYoung to collect the win; again all drivers transferred into the show. The AELMT came back on track for the 12 Lap POET BioFuels Last Chance Qualifier. Richy Weiss picked up a nearly two-second win over Rich Bell, Hudson O’Neal, Bob Gardener, and Frank Heckenast – the five drivers transferring into the show. The field had been set for the grand finale, the 8th Annual Thaw Brawl Presented by Hoker Trucking, 75-lap, $15,000 to win main event. Kyle Bronson and Jason Feger lead the 21 car field to green, with Brian Shirley jumping to the early lead. The first few laps were caution troubled, with the second caution of the night coming on lap 12, as Hudson O’Neal got loose coming off the second turn before spinning around. The restart would prove no problem for Shirley as he continued to lead through the halfway point, while the rest of the field jockeyed for position. Shirley’s night would come to an abrupt end on lap 40 after a flat tire forced him to the rear of the field, and ultimately out of the race. That would hand things over to Bronson and Simpson to fight for the top spot. Bronson would struggle to get the car hooked up over the next run, as Simpson took the lead following a lap 46 crash involving Schlenk, Travis Stemler, and Frank Heckenast. Simpson got company quickly as Pierce was able to get his car to work on the bottom of the race track, just in time for Simpson to get held up by lap traffic. The pair of 32s battled each other while trying to navigate Gardener on the bottom of the track – while they did that, Tyler Erb did his best to maintain momentum around the outside. All three drivers cleared Gardener on the exit of two, but it was Erb who had the best run, going three wide around both Simpson and Pierce to take the lead. Erb wasn’t clear to the win yet though, as changing track conditions continued to plague drivers through the turns. Erb’s car got out of shape exiting turn two, allowing Pierce to slip back by. Erb though, waiting his turn to strike back, as Pierce battled with Stemler trying to put him a lap down. Pierce, still committed to the bottom, couldn’t quite clear Stemler in time, as Erb shot back to the choppy top shelf to complete the pass, and drive on to the win. The victory is Erb’s first for the Thaw Brawl, ending Pierce and Simpson’s hopes of another Belt. The 30 Lap AEmods feature capped off the American Ethanol portion of the night, with Frank Marshall and Allen Weisser leading the field to green. The two dominated the event, with the only challenge coming from John McClure who tried to find momentum to over take Marshall, with no luck. At one time, Weisser opened up an over four second lead on Marshall. Weisser would hold on to collect the win. The next event for the American Ethanol Late Model Tour comes on Friday April 19 from I-96 Speedway in Lake Odessa, MI. The AELMT returns to the track that graced 2018 Champion Brandon Thirlby with his only win last year. 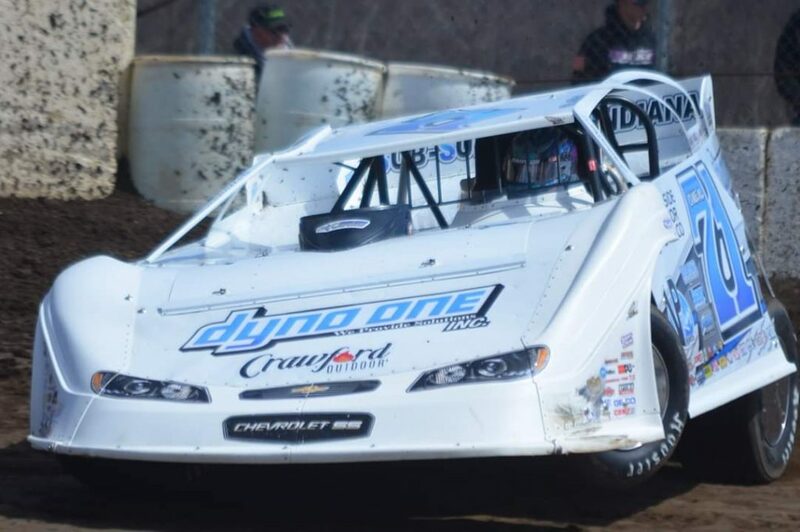 For the AEmods, they’ll join the AELMT on Saturday, April 20th at Plymouth Speedway (IN) for their first ever trip to the speedway. For more on the AELMT, log onto aelmt.com. Enjoy behind the scenes content, race day updates and more, by following the AELMT on social media, including Facebook, Instagram and Twitter. Keep up with the AEmods by logging onto aemodt.com, and find them on Facebook, Instagram, and Twitter. For full schedule please click here.